Inspired by the recent discovery of bean / chickpea brine as a suitable egg white substitute, our theme this month is "Bean Cuisine." We will devote this month's entire collection of cartoons to the amazing concoctions that come from the humble bean's humble brine. Growing up, Lucky Charms did not make many appearances in our house but I distinctly remember the 1 or 2 boxes that crossed the threshold into our cupboard when I was about 10 years old. Ever the responsible adult, my mom reminded us that marshmallow cereal was an unacceptable breakfast item and promptly relegated it to the snack category. Unsurprisingly, my older brother and I ate all of the marshmallows (at snack time, of course) and left most of the cereal in the box. Fortunately, my mom claimed that the marshmallows in Lucky Charms were “too sweet” while the cereal was “just sweet enough” compared to the twig-like Kashi cereal she enjoyed at the time. So began the short-lived but glorious Lucky Charms symbiotic relationship between child and parent. 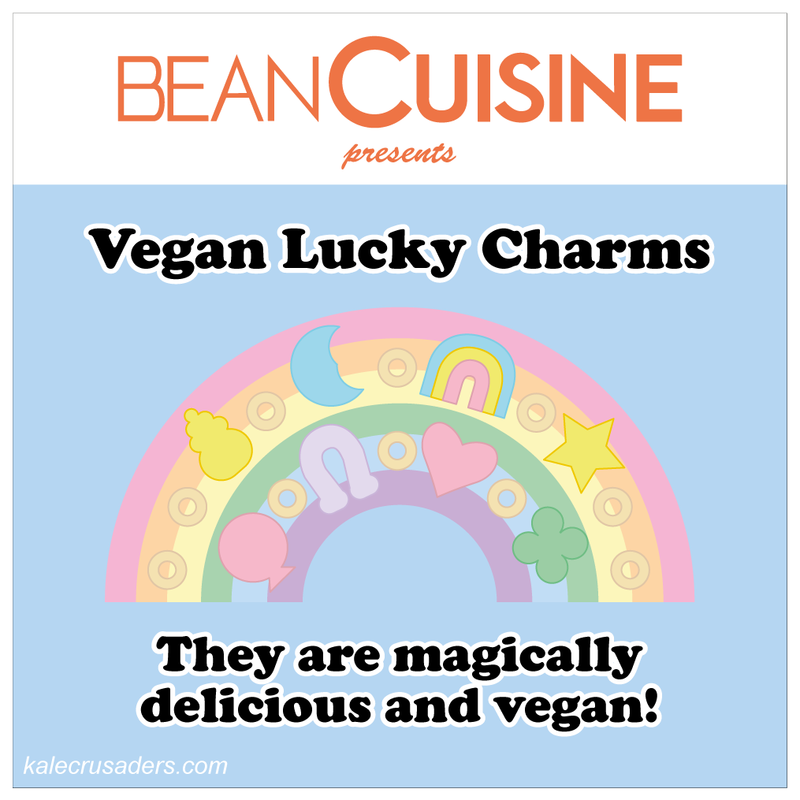 Thanks to Kelly Peloza at Seitan Beats Your Meat for this amazing Vegan Lucky Charms recipe, inspiring this cartoon, and for bringing back a random, quirky memory of mine. Little known fact: the Kale Crusaders Headquarters is located a mere 15-minute walk from the birthplace of Marshmallow Fluff in Somerville, Massachussets. 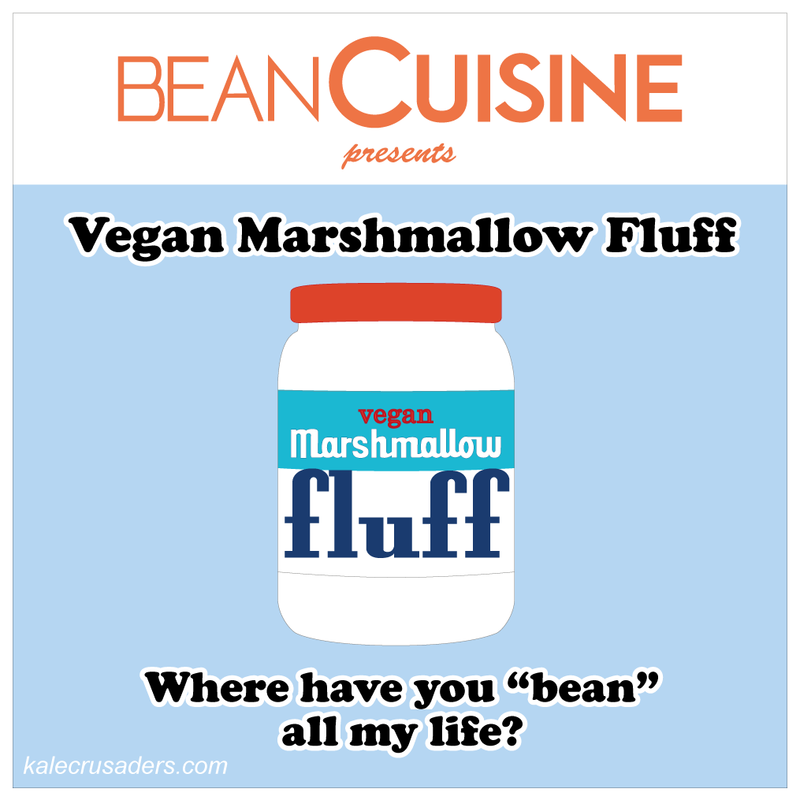 Unfortunately we have not attended Somerville's annual Fluff Festival because of the lack of vegan options, up-to-and-including the Marshmallow Fluff. But now thanks to Mihl of Seitan is My Motor and her innovative Vegan Marshmallow Fluff recipe, we can hold our own Vegan Fluff Festival in our own kitchen whenever we want! 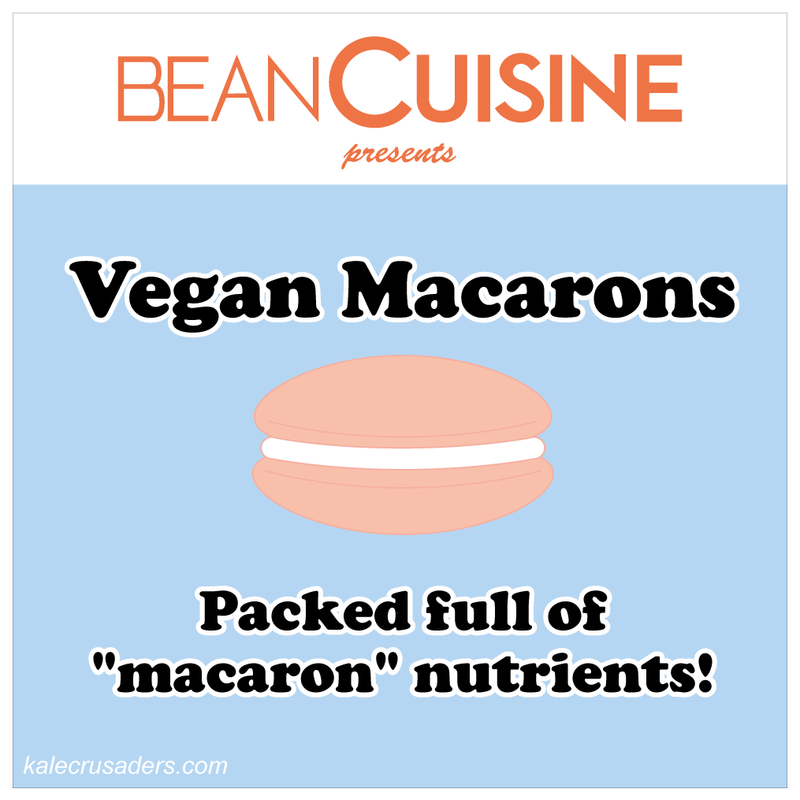 Charis Mitchell from Floral Frosting has cracked the vegan macaron code with the assistance of the almighty chickpea brine. So far Charis has baked up Cookies & Cream Macarons, Peaches & Cream Macarons, and Funfetti Macarons with Rice Crispy Treat Frosting. We can't wait to see what she dreams up next! Becky Striepe, of Glue & Glitter fame, first exposed us to the bean / chickpea brine egg white substitute phenomenon back in March. 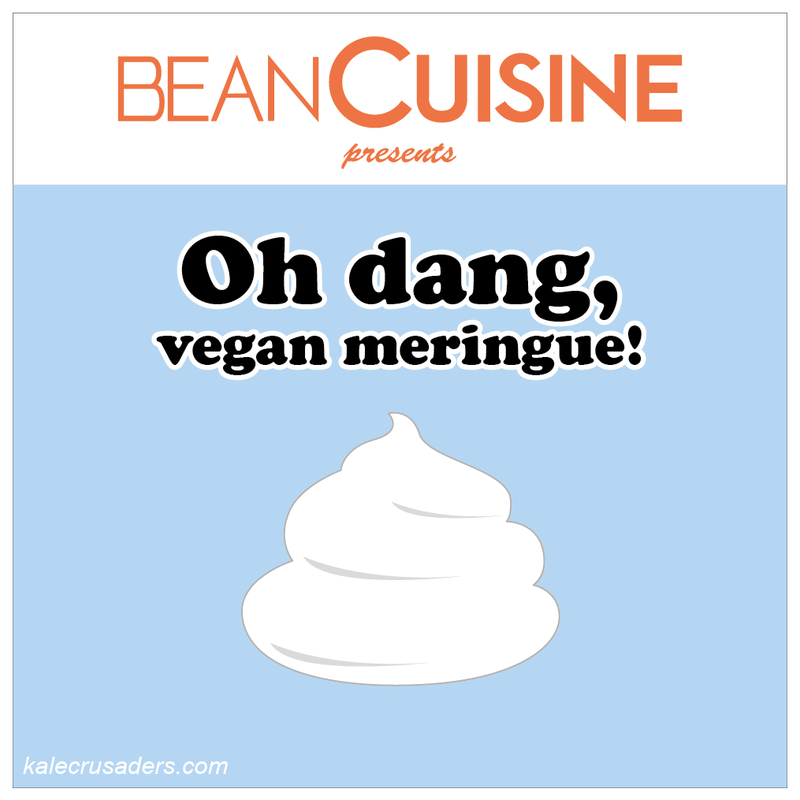 Thanks to Becky, Vegan (White Bean) Meringues are now within reach!